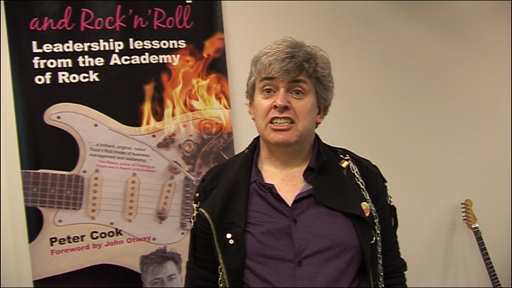 BBC News - Can comedy and rock 'n roll help business? Can comedy and rock 'n roll help business? What can improvised comedy and rock 'n roll music teach business? Quite a lot, it seems.
" when offering an idea at work? Comedian Neil Mullarkey explores how these two responses lead to quite different outcomes with people who attend his business workshops. Improvised comedy meets business when he teaches "how improvisational theatre works, and its connection with organisational behaviour". In other words, he tries to show how improvisation comedy skills can help people in business. One of the games he gets his workshop participants to play is to set them off with a statement, to which they must reply with a sentence starting with "yes, and....". It takes the conversation into totally different realms, rather than closing them off. Neil Mullarkey co-founded the Comedy Store Players almost 25 years ago, and he is also hired by companies and organisations to use comedy and improvisation to try to improve how people work. "Improv can apply to strategy, leadership, creativity, communication, teamwork, even negotiation," he told Radio 4's In Business. Why? "Because the basic thing of improv is to listen closely to what the other person says." He admits that good businesspeople listen anyway, but that "a lot of people are too busy thinking about what they're going to say themselves, and so they don't listen." Is the "yes, and" game more than just a game though? What difference will it actually make to people's behaviour at work? At one of his workshops, participant Alison was struck by how negative the word "but" is, and as a result, she says, "I'm going to consciously decide this week not to use that word". Neil Mullarkey is not surprised. "How do we hear a "but"? Everything before the "but" is deleted when we hear the word. 'Yes, but it is going to be too expensive', 'yes, but bosses wouldn't like it'. People then stop coming to you with ideas." Another game he gets people to play also focuses on listening. Each person is allowed to say only one word at a time, adding to what has been said before, and between them they build up a story. No one has control over what is being said, everyone is respected equally, and that opens up new possibilities. "It's creating a form that emerges as it grows," he explains. "This particular way of creativity embraces the unexpected, it's not ad-libbing, going off script, it's encouraging the positive outcomes that emerge from ambiguity and uncertainty." And rock 'n roll, how can that help business? Peter Cook, a musician and former scientist with an MBA, also runs workshops. He uses music to teach businesses how to be more creative. "Creative leadership is why some companies learn and adapt to change, and others don't." "It's about mindful creativity," he explains, "thoughtful thinking, ideas that work and will be sustainable, rather than any old idea." At a recent workshop at the Ideas Lab at London's Imperial College's Engineering Department, he got three participants to work together to improvise a blues song. Course attendant Miriam Bartlett, a freelance insurance lawyer, was impressed: "You got three people to come up with something coherent and fun, on the base of shared knowledge and division of labour. And you have to listen to each other, otherwise you get a cacophony. That works in business, too." But do you need music for that? She admits she already knew the principle, but that "it's a powerful way of reminding people what the basic ingredients are." "I used to be a manager," she adds, "and have sat in all sorts of training seminars. They didn't stick in my mind the way this 5-minute jamming session did." One of the three jammers was Andrew Wood, director of learning and development at the international market research company Synovate. He also plays his guitar several times a week. Did he learn anything he can apply to his business? "The ability to make healthy mistakes, that's really important, to give people the licence to do that." But what is the specific connection with rock music? Performance criteria, boxes to tick, an appraisal system at the end of the year, those things squeeze the life out of very many creative people"
"To get to that finished record, you have to have been allowed to experiment, make mistakes, rehearse. "The first take won't be the final take. The message is: it's ok to do that, so long as you don't do it in an environment where it damages the business." Another member of the audience is Dennis Tourish, professor of leadership at the University of Kent. What does a specialist like him make of the rock 'n roll approach to leadership? "I think that leadership, creativity and innovation are important things in organisations. But to do it well, businesses need to find ways of letting people bring more of their non-work lives into work with them, like music, to allow them to be themselves." How is this rock 'n roll element more than a metaphor though? "People don't stop being Jo or Dennis or Fred because they're at work," he points out, "but some management systems force them to do just that. "In work, we're expected to become a regimented corporate citizen, and people don't behave in their best in that kind of environment," Professor Tourish argues. "So yes, it's a metaphor, but more. It's a lot about improvisation. In many work places you dare not improvise. "There is a detailed job description, performance criteria, boxes to tick, an appraisal system at the end of the year that won't evaluate you on your improvisation, but on how well you existed within your existing structures. Those things I think squeeze the life out of very many creative people and businesses." And can a short workshop generate change? Peter Cook remembers that one participant, a Human Resources director, went and cancelled all her organisation's appraisals, after hearing another professor talk about how "useless" appraisals are in one his sessions. "So, just occasionally," he adds, "the hour does work." Neil Mullarkey and Peter Cook appear in BBC Radio 4's In Business on BBC Radio 4 on Thursday, 17 December 2009 at 20.30 GMT and Sunday, 20 January at 21.30 GMT. You can also listen via the BBC iPlayer or subscribe to Peter Day's World of Business podcast.